Oh, Lush, Why Do You Do This To Me? | Bright & Beautyfull! Oh, Lush, Why Do You Do This To Me? Not that I don’t want you to send me things — OMG, don’t stop sending me things! — but I swear, anytime there is a thing inside another thing, I go cray-zee with wanting to play! 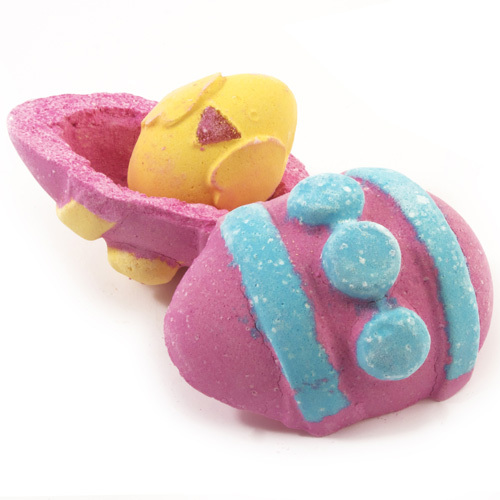 The Immaculate Eggception is a double-layered bath ballistic, and you can hear the thing inside the thing rattling around. I made myself sit down and breathe, which allowed me to enjoy the Lush-y scents of vanilla absolute, ylang ylang, and grapefruit, and also to get a grip. Not on the egg though, with the view to OPEN IT AND SEE WHAT IS INSIDE, but in order to calm down, because my water heater is waiting to be replaced and I can’t draw a bath. The plumber is in tomorrow, and so I will have to just hang on til then. And given that the weather is bright and sunny, like, it is so not bath time, right? ← Are You Feelin’ Lucky? Pingback: Three Days Down the Country: High Maintenance, Wha’? « Bright & Beautyfull!